Differential Absorption LIDAR (DIAL) is a remote sensing technique to measure gaseous mass emissions in the atmosphere. 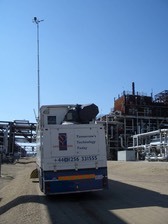 It has been largely used to measure airborne emissions from gas, oil and petrochemical plants, but can be applied to many other emission sources. This site gives an outline and some background as to how DIAL has developed from the late 1970s to date.